Not only is Jamie Jennings a comic book artist, she’s her own editor, writer, and more for her heart-throbbing, cross-dressing webcomic Lavender Legend. Jamie Jennings, 29, first drafted her idea for Lavender Legend (LL) in 2007. Her concept evolved from when she had seen a few occasions in pop culture where women passed for men. At this point, Jennings hadn’t seen any other work about the sexes vice-versa and wanted to create a story that highlighted a different perspective on gender roles. Jennings didn’t based her characters off of any other artists’ work but did start off with intentionally making Princess Lavender a sort of “amalgamation” of princess characters from fairy tales and Disney films. As the story progresses and Lavender gains more worldly experience, the princess steadily comes unique. It’s no secret that the Alabamian’s characters have unique names like Tobith Grengis, Amaranth, and more. For Jennings, she picked out the most feminine name she could think of for Felicia so readers would not instantly try to give him a masculine nickname. Princess Lavender and her sisters all have colour names. “…others might have been as random as a street sign I saw on the way home,” says Jennings. Readers may be confused as to why Felicia is the main character to a webcomic that seems to be named after Princess Lavender. The 29-year old explains that the colour lavender is a blend of pink and blue which represents a “duality” between both genders. A page of LL can range from as little as four hours to a detailed 12-hours averaging to eight hours of careful work. The artist says she can usually get a page done within a day. Many digital drawing software are available in recent years and Jennings recommends finding the most inexpensive ones to begin with if people are new to digital art. 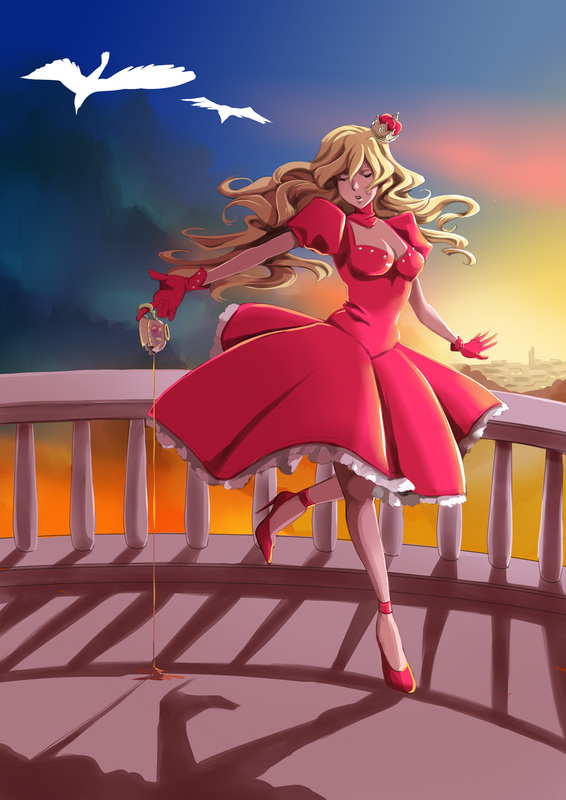 The LL creator uses PaintTool SAI to draw and ink her comics along with an older version of Photoshop. The Alabaman insists anyone can draw if you just grab a pencil and “go bananas.” She says people have to enjoy the childlike “doodle” art phase. Jennings explains that drawing at a skilled level is difficult and artists will repeatedly run into a wall. She says that people need to enjoy drawing for the “pure sake” of doing it or why put one’s self through all that hardship? “In the end, your skills come from practice and not from the software you are using,” says Jennings. The LL manager shares what a professional like herself critiques in someone else’s webcomic. She says the first thing she looks for is what the comic is about and what is happening in the comic. “Many people like to make up characters but they don’t have a plot, or they use a lot of exposition to explain what’s going on instead of just letting it happen,” says Jennings. Her number one piece of advice is to try writing something short to start out. She emphasizes that artists should not try to make the first thing they’ve ever created into their lifelong work. Jennings says it’ll take a few attempts before artists know what they’re doing. Some people may underestimate how hard it is to manage a website thinking it’s easy with a few clicks of a mouse. Jennings is not only her own producer but the writer, editor, and comic book artist forLL. She also takes care of her online store and the only assistance she receives is from programs like WordPress. Jennings’ far-off dreams for Lavender Legend is for it to maybe become a video game or an animation video. Her foremost goal is to complete LL since she had originally planned to complete eight books but it’s been about six years and she’s done four. Since she started the story the plot has expanded to 10 or 12 books. “…I’m just trying to work to get the story done without taking another 6 or more years,” says Jennings. Jennings’ merchandise includes three volumes of Lavender Legend, print editions of other works she’s done but she mostly sells art and knick-knacks like bookmarks or keychains. The 29-year old enjoyed Colossalcon (located in Sandusky, Ohio) the most. “…it takes place at a water park resort, and everyone is just having a lot of fun and partying the whole time,” explains Jennings. Aside from her webcomic Lavender Legend, the Alabamian works for Filthy Figments (a subscription site for 18+ comics) and works part-time seasonal jobs when she isn’t attending conventions. She has also done other webcomics like her first work, Emerald Winter (has been on hiatus for years), a Not Safe for Work (NSFW) comic called Rose Slayer, and more comics for Filthy Figments. The LL writer says she has fewer fans in numbers than most comics that have been around as long as her own but proudly says her fans make up for the numbers with their encouragement. She occasionally receives fan e-mail and shares that some fans tell her that Jennings’ work made them feel better about themselves whether it’s wearing what they want or being who they want to be. “I feel like if I can make even one person feel better about themselves, that’s the best thing I could ever do,” says Jennings. 'Original Sin' #2: Are the heroes really ready to open up a "Bomb Full of Secrets?"